Burberry adds to its watchmaking repertoire a new limited-series collection. Comprising four versions, The Britain S/S15 Runway – The Birds and The Bees is inspired by the hand-painted prints from the Prorsum womenswear show for Spring/Summer 2015. 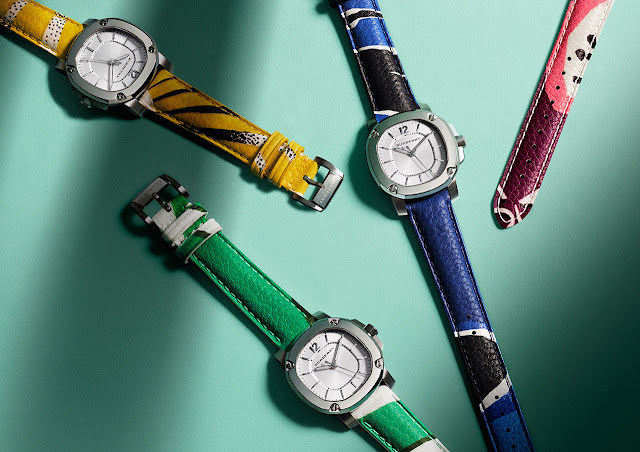 The straps, in damson, daffodil, peacock or dragonfly, are crafted from the same leather worn by the models in the Prorsum show. Each echoes the vibrant patterns of the different runway outfits, in a mesmerising rainbow of colour. As always, design is courtesy of Christopher Bailey, artistic director and CEO of Burberry. Leather in daffodil yellow, dark damson, peacock green or dragonfly blue with printed motifs. Buckle.